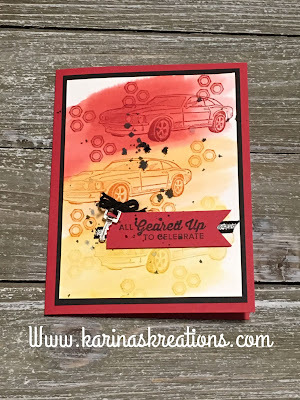 Karina's Kreations: Stampin'Up Geared Up Garage Watercolor card! Stampin'Up Geared Up Garage Watercolor card! I had so much fun making this card! What do you think? Too artistic? 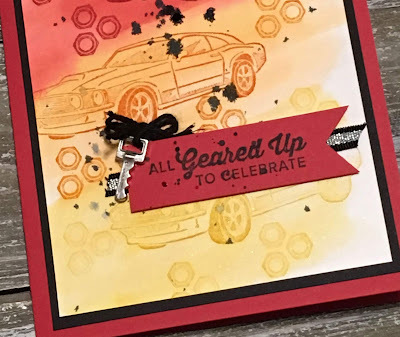 My card uses the Geared Up Garage stamp set from Stampin'Up. 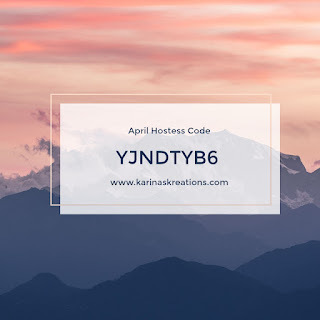 This is set has 10 images in total, 5 sentiments and 5 images. It even has coordinating thinlit dies if you want to die cut out some of the images. I started with a piece of 3-3/4" x 5" Shimmery White card stock and brushed water over the surface with my aqua painter. I spread Real Red, Pumpkin Pie and Crushed Curry ink over the wet surface of the card stock. You can use a Heat Tool to dry the card stock or let it air dry naturally. The car and nuts image was stamped with coordinating ink colors. Did you notice the little metallic key on the corner of my sentiments? How cute is this embellishment? I wanted to add a little black onto my card so I tapped some black ink onto the card using an aqua painter. Looking for a demonstrator? I would love to help you. I have an online order reward program. Click the link at the top of the page to check it out. Please click on a picture to place an online order.